I am inspired to write in response to Rev. Colin Coward's blog Unadulterated Love and in particular his Living and loving in evolutionary times of August 10, 2016 responding to reactions online after the 23 July blessing of a marriage in St Agnes Church, North Reddish, between the immediately retired priest in charge, Clive Larsen, and his partner John, with Colin Coward participating. As far as I can see, he is responding to need with provision, but obviously controversial to some others who have been jumping about online. What interests me is the basis of Colin's faith that establishes a very different attitude towards assisting others from those of his institutional critics. The blog entry summarises a more general position. So he criticises the use of the Bible as social control leading to abuse, from one target to another. Focusing on sin and guilt leads to negative impact. Whilst politics and society has moved on, the Church instructs clergy to follow previous mores. And yet the service conducted was celebratory and reflected loving partnership. He asserts that faith is changing, and that this is evolutionary and demonstrating creative energy. Those who fear across the world are resorting to violence, and the Churches are defensive with its anthropomorphic God, a supra-being, where old ways of understanding are reinforced by liturgy, hymns, prayers and teaching. Dogma, hierarchy and control plus infantilising result in abuse. He notes a negative environment he can experience in church. It is too head centred, without, he states, the heart and breadth of the unconditional and infinite and love to characterise the God of Jesus the Christ. This is set against Christianity with all its life-denials. Yet he also says there is much in Christian teaching that can enhance life, the source of his faith and the inspiration. I have much sympathy for this view, but it doesn't quite add up. It comes down to the question, 'What is Christianity?' I have this argument with others who identify as Unitarians, who also identify as Christian or of Christian sourcing. For me Christianity is indeed centred in the New Testament and identification with those in the early Church who identified Jesus as the Christ, or the Messiah. This still allows for a highly critical interpretation of the Bible, of both Testaments, with every device in play. It identifies with those who did (and do) turn a Jesus who looked from himself to what he understood as the 'Daddy' God in end times into a cult of personality about Jesus himself, that he is intimately connected with God. So far I have introduced no main doctrines, except for the way the economic trinity was begun in this sense, in the eschatology of those days, in their peculiar cultural supernaturalism. Now my argument against many Unitarians for example is whether, for them, Jesus is the Christ and they identify with this community and its turn. If they don't, how are they even minimally Christian? Now Colin still makes this claim, but it rather feels like it is on its last legs. What he is doing is claiming an ethical outpouring from Jesus as the Christ which, for me, is far from demonstrated. How do we know this? If things are truly evolutionary, then we have an ordinary man in every way, culturally limited, and who has to learn. He can only adopt and adapt to whatever it is that makes him this outpouring of unconditional love. But if I read the texts, he clearly is not doing this outpouring. He is Jewish first, that is his method, and his breadth is corrected, and the universalism is provided by Paul and his cultural crossover. And, in any case, we have only 'difference by degree' by which there is insufficient evidence either about Jesus or anyone else. You see, very soon the principle of unconditional love supersedes anyone who may have it, and no one can have it exclusively. The claim must be ahistorical, become an ideal. Or else it is based on apriori doctrine, that theology comes before ethics, that the Church determines the reality of the universe especially in ethical terms. Or maybe it comes in the realm of some picture of reality, but only a picture, a kind of mythical bubble, and one superfluous surely to the main point. But evolution is NOT this wonderful, open, love-encouraging reality. It is, rather, change by death. Things that cope less get overwhelmed by things that cope better, in any environment. What is more interesting, I suggest, is the existence of chaos (in which evolution is one example) followed by systemic interactions of what results. What is more interesting, also, is the beauty of equations, where Paul Dirac can state that the more simple and beautiful an equation, the more likely it is to be really true - not just metaphorically true, but descriptive. That is a very powerful signal of transcendence. Evolution is cruel, chaos is a swirl that can lose many, and yet there is emergent order and simplicity within complexity. This is not Christian: none of this is Christian. Christianity is, in the end, regulative. It is regulative about the texts on the early Christians; it is about that odd notion Rudolph Bultmann claimed - kerygma. Somehow Christianity is released when it is preached, but along given texts, many of which are ethically harmful. Rowan Williams is one who digs into the tradition and lives within it to make much of it in a critical way without ever dismissing what is harmful. But if you are liberal, like me, you do dismiss what is harmful, and you select from anywhere. It is really so simple: two men or two women loving each other, as a man to a woman, is evident. It clearly comes within experience, and it is worthy of ritual recognition. It is not for nothing that Yale Postliberalism and Radical Orthodoxy dismiss (or manufacture) experience, as they follow either a regulative path or some narrow Platonic idealism institutionalised. They have retreated into bubbles, but those who experience change cannot retreat into bubbles. Of course a Rowan Williams tries to have it both ways, thus will be in the tradition, criticise it, never drop it, become restrictive as Archbishop, freer and more inclusive when an academic. The latter position becomes a kind of ridiculous lack of discernment. Why does Rowan Williams think that liberalism came to an end point in 1978 or thereabouts? Because the tradition was under threat, whereas Colin knows that the whole 1960s to 1970s made theological discoveries that continue to matter to this day. Indeed so did the liberals much earlier. John A. T. Robinson inspires Colin as he does many still, but J. A. T. R. never went to where truth would lead. He kept starting - a personalist panentheistic theology and biblical conservatism. More anchors there, and more than Colin shows in his own expansionist theology. I hate postliberalism, Radical Orthodoxy, and whilst I have some time for Rowan Williams, it is ultimately deceptive, the 'as if' history when it is all literature upon literature. It did not surprise me when Don Cupitt said, 'My critics were right all along,' meaning that he was left without the ability to attach himself to regulative or even high and dry Christianity. He didn't just give up his ministry, but his participation; he reinterpreted Buddhism and adopted a religious humanism and became a Quaker sympathiser. He cannot argue now for any kind of Christianity: he cannot be liturgically conservative and try and make it stand on its head. The fact that he or I in different ways might use Christian or Christian derived theology to make several points does not make us Christians. As I say, to be a Christian is to identify with the early communities and they both read and formed texts to make this cult of an individual. They effectively created a history of the world by which a God intervenes and sets up means for redemption. I don't believe in that: I believe our world came about through chaotic systems of physics, chemistry and subsequently biology, out of which symbolism and culture came. This Christianity is no more than mythology that gives insights into human anthropology. I bet this is Colin's view, but as I say he makes a final claim. But devoid of regulative doctrine, devoid of regulative text, there is no basis for that turn into what Christ apparently represents, except by some made-up idealism. In the end, I'm afraid, the mainstream Churches are doomed to defend and promote their own mythology. From that authoritarianism and infantilism does arise. From that evident love is denied. So why continue to defend the institutional dead-end? Other than that, I'm with his sentiments and outlook. Since written, the next day Colin wrote a follow-up that isn't particularly Christcentric or Jesucentric at all but it is entirely consistent with what my response here discusses. He recognises his own revisionism, which is fair enough, although I think (as above) that his stance stretches beyond revisionism. I seem to be only blogging about politics these days. On religion I seem to be fairly quiet. Take that as a sign of relative contentment. I might nevertheless write something very soon. Politics keeps changing after a seismic shift in the landscape - that's the simple explanation. Labour's potential split is around the corner and the Tories' in about two years or so. The Tories' split is at the time of the inability of squaring the exit the EU circle, the absence of Parliamentary time and Civil Service resources to come out of the EU, the timing of resisting the-break up of the UK, and the realisation that if Universal Credit - one big change - can't get done successfully in more than a decade then coming out the the EU is nigh on impossible. The Labour Party has 230 MPs sitting in the House of Commons. Initially, 80% have stated that they have no confidence in the leadership of Jeremy Corbyn. 80% is, accurately, 184. 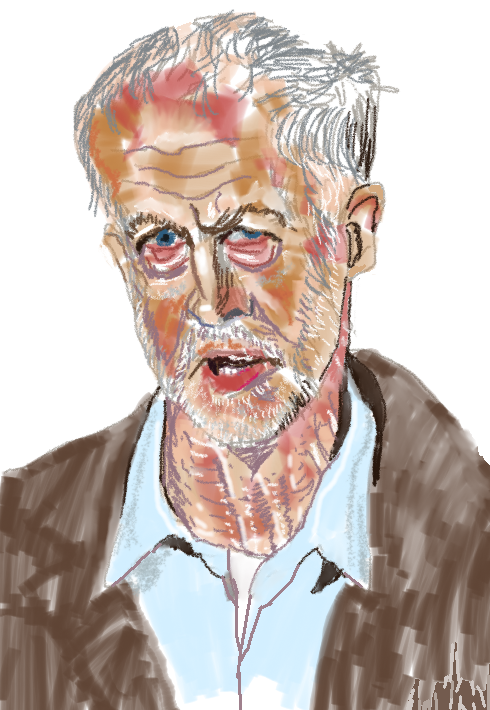 When Jeremy Corbyn wins the leadership election, as he will and easily, a good number of those 80% will assess that they had better knuckle under and do no more - say 20% or 46. This leaves 138, and let's suppose they would form some sort of informal opposition. Why so? Well, because any attempt to get 'The Labour Party' title deeds from the current leadership hasn't go a hope in hell of success, if the election of the leader has been done according to the rules, where the actual membership overwhelmingly chose the leadership. The 138 might consider approaching the Speaker to claim that they are the real opposition, but only an informal opposition may not be sufficient for the Speaker, who'll go by real title deeds and a demonstrative leadership election. But suppose 46 of them are not happy approaching the speaker. So 92 we might guess would at least approach the speaker. But at precisely half, the speaker would also dismiss it on the basis of not an overwhelming number of Parliamentarians involved. So then it comes to the die-hards, the people who have spoken out so much that they really cannot go back on their words, plus those so far from Corbyn ideologically that they have to be otherwise. So suppose 46 really would not want to split. This leaves 46 remaining. Some number like this could well be the dedicated splitters. In reality, it is probably fewer MPs because this means taking a different name, a different party, a different organisation, and with memories from their parents of those in the SDP. But it could be more. I don't subscribe to the view that all non-Corbyn MPs are charlatans without principles and would do what it takes to keep their cushy jobs. Plus the necessary follow-through of deselections is going to include those who are known not to fall in and are just tagging along for the time being. So 46. Some splitters would rather not, of course, and they hope Theresa May calls a General Election by which we can all suffer five more years of Tory government, Labour is wiped out and Corbyn then has to go (but don't you believe it!). Five more years from that membership means a programme of deselections. So this is how it becomes more than 46, how even a General Election will not save the Labour Party from its leftward move, if indeed 'save' is the correct term. Try 'prevent' instead. Follow the logic, and the split seems inevitable, because the range of Labour from softer-left to centre-right (let's be honest, some are in the wrong party, pushing its coalition to a ridiculous breadth) will not be compatible with a Momentum-shaped Labour Party. A General Election will not save them and so the rules have to be written from the beginning. The 46 will look to work with the 8 Liberal Democrats, and may be the Tories' splitting much further down the line. The 46 may want their own identity, but an electoral pact if resisting coming out of the EU with the Liberal Democrats may be essential. There needs to be a clear General Election option of saying this negotiation did not work, is not practical, cannot be done, and therefore staying in the EU, hopefully before Article 50 is invoked. Strong coming-out Tories will have to argue for invoking Article 50 and doing so on less economic and more cultural-immigration grounds. Tory UKIP, basically. It's not clear who'd split from whom. It could be again that some Tories would split in order to be resisting invoking Article 50. What is clear is that the EU referendum has not solved the Tory Party division. When the facts on the ground speak, the division will be back. For many, the economic option is not good enough, and that division forces an economic option into the EU resistance option. Even a huge Tory majority after a General Election (if it happened) would not save the Tories: it could split so comprehensively that a big majority turns into none. In any case, four parties as of now cannot operate in a First Past the Post system, because the outcome is a pure lottery. If the main two UK parties split, proportional representation becomes a necessity.